Q: "What are these coins worth?" Q: "What were these coins worth in their own time?" A: We're not really sure, but probably not very much. How do we know? First, because we find so many of them. These coins were also part of a "fiduciary" or "token" monetary system, like our paper money, where the value assigned to them fluctuated with market conditions. Since the coins you are cleaning primarily come from times historians know to have experienced terrific inflation, we can assume that the buying power of a single coin was probably not very great - possibly something like a quarter, or even less, in our own money. Q: "What are these coins worth today?" and, "What would these coins be worth today if they were in outstanding condition?" A: Late Roman bronze coins like the ones you're attributing currently sell for $1.50-$2.00 apiece, unprepared for attribution, but their real value is to be found in what they can teach us about the people who made and used them and their lives and times. Coins like these, when attributed, depending on whether or not they are scarcer types, and of course depending on their condition, may be worth from $1 to upwards of $50 to a collector. If you find something that is both truly unusual and perfectly preserved, it could be worth much more, but it's safe to say that most of these are not likely to be worth more than a couple of dollars on today's market. Q: "Where did these coins come from?" A: The vast majority of uncleaned material on the market at the present time comes from Eastern Europe - the "countries formerly known as Yugoslavia" and Bulgaria in particular - but ancient coins can be and are found wherever the people who used them lived. Coins are also commonly found in Western Europe and Great Britain as well as the Middle East, Turkey, and Northern Africa. Q: "Do finders and dealers pick over these coins first? At how many points along the way have they been picked over? What is the chance of an unattributed batch containing a rare find?" A: These coins are found - dug up - by people whose primary interest is selling them for as much money as they can get, so yes, they are most definitely picked over at several points between their discovery and your hands. The diggers will immediately pull any gold or obvious silver they find. Large or obviously attractive coins, and those showing enough detail to identify them as potentially valuable will be pulled out at this point as well, or will be by subsequent shippers and dealers. The dealers in the US from whom we buy these coins typically claim they do not "cherry-pick" their lots, and many actually may not, but there will not usually be much of great value that is obvious before cleaning left in the lots at this point. Dealers do, however, usually remove bent, broken, holed, or obvious "slug" coins, so there is really no such thing as an "unsearched" lot of ancient coins, despite dealer's claims. For our purposes, the working definition of a "rare" coin is: "You don't have one!" That said, you must understand that even the commonest late Roman bronzes are rarer, in absolute terms of number of existing specimens, than the most sought-after of "rare" US coins like a 1909-S VDB cent, or 1916-S dime. Q: "Did these coins ever get worn down from heavy use, or always from interaction with soil? Were any of them slugs to begin with?" A: Yes, some coins were in circulation for many, many years and got worn smooth in antiquity. Some coins discovered by later residents of these areas actually re-entered circulation as recently as the 19th century, becoming more worn. Exposure to soils does not "wear" coins down but instead corrodes them, so it is possible to find a coin with almost no "wear" that is nevertheless essentially obliterated by corrosion. ALL these coins were struck by hand, between hand-held, hand-cut dies, most of them in an exceedingly great hurry, so poorly struck coins with little detail or very shallow relief from shoddy workmanship or worn-out dies are also very common. The amount of wear is completely dependent on how long it was between the time the coin was struck and when it was buried, so it is also possible to find coins that are essentially like new. Q: "What is the difference between an EMPEROR and a CAESAR?" A: The term emperor comes from "imperator," originally a term for the commander-in-chief of the armies, which dates well back into the period before the Empire. "Caesar" was the given name (cognomen) of Gaius Iulius, the man we know as Julius Caesar, who initiated the imperatorial period between the Republic and the Empire. Interestingly, although the term "Caesar" meant "a fine head of hair" in the vernacular of the 1st century BC, Julius Caesar suffered from male pattern baldness, and the name may have been given him in gentle mockery. Many early emperors, who adopted the name "Caesar," were in fact related to Julius Caesar. In time it became a title, a part of the formula of the official name of any emperor. Eventually it became the term used to describe a crown prince, or heir to the emperor, whether or not that person was actually the son of the emperor (biological or adopted). For our purposes, when we see an inscription ending in NOB CAES, NOB C, NC (Nobilissimus Caesar) we are looking at a coin of a junior partner in the Imperium. IMP on a coin, on the other hand, always denotes the senior partner, a ruling emperor. Q: "How do you tell the various coin portraits of the Constantinian dynasty apart?" A: Good question! - If you find a way, please let us know! Unfortunately, realism in portraiture was in serious decline in the 3rd and 4th centuries AD. The "celatores" - the die engravers - were only trying to represent "a person," as opposed to "a particular person," resulting in cartoonish portraiture at best. A careful reading and recording of the obverse inscription is the only absolutely certain way to tell the difference between the coins of certain imperial personages at certain times. In a very few cases, one can tell them apart by observing other characteristics of the coins - for example, Constantius Gallus is always shown bare-headed, making his coins distinguishable from similar ones of Constantius II. Other coins' reverse types may be associated only with certain emperors. If it is uncertain whether a coin depicts Constantine I or II, for example, it will help to observe whether the inscription contains "IVN" (Junior), or "NOB CAES," either of which would designate the younger Constantine. Reference books are your best resource for making these minute determinations and discriminating between similar coins of similarly named emperors. This can be one of the most difficult tasks we encounter in trying to understand the coins of this era. Q: "Could old coins be used when a new emperor issued new ones?" A: In most cases, yes. Sometimes a new emperor would call in the existing coinage to be re-issued with new reverse types, and of course, the all-important new imperial portrait. This was most common in earlier imperial times, when the silver was in the process of being debased, or when coins were being "downsized" so the government could make more new coins out of fewer older coins and get a new message and portrait out to the people simultaneously, but the "fineness" of the coins we're working with had stabilized at only a few percent of silver and the types did not change as often as in the earlier empire, so older and newer coins circulated side-by-side. In the early Empire, it was not uncommon for the coins of an earlier ruler to be called in and counter-stamped with an official punch that allowed very worn coins to continue circulating, perhaps at a lower value. Sometimes the coinage of a very unpopular former ruler would be called in to be re-coined as well. Q: "Do we know if emperors dictated what events were to be depicted on the reverses, or was that left up to supervisors of individual mints?" A: The Roman emperors, not unlike modern politicians, had vast staffs of advisors and "spin doctors" to direct the day-to-day operation of "The Imperial Propaganda Machine." The coins were an important part of this process, particularly in a time lacking mass media, as we know it. The types of the Roman Imperial coins were invariably centrally dictated. How much input the emperors themselves had in this process is not known with certainty. In the times before the First Tetrarchy, there had been a system of far-flung provincial and colonial mint-cities, which mostly were allowed to coin locally acceptable denominations - usually only in bronze, but occasionally in silver - using any reverse types they pleased, so long as the emperor or other imperial personage was portrayed on the obverse. By the time the coins we're studying were issued, however, that system had been abandoned in favor of a centrally controlled system of strictly imperial mints simultaneously striking the same types throughout the Empire. Q: "Were there ancient fakes?" A: Most assuredly! Counterfeits and "unofficial issues" are every bit as ancient as coinage itself. It is important to distinguish between counterfeit and contemporary copies, though. A counterfeit was a conscious attempt to defraud by producing a coin of less intrinsic value than its prototype - perhaps by silver-plating a copper or lead core. Some contemporary copies were an attempt to provide familiar coins in areas not served by imperial mints. In the later Empire, the distinction between "counterfeit" and "official" coinage became increasingly blurred as cities formerly within the Roman sphere of influence tried to continue to coin familiar types of money although the Empire had shrunk, leaving them as islands of Roman culture in "barbarian" lands. Quite likely, as many as 10% of the coins you are studying were not from official mints. You may find coins that are too small, too thin, underweight, or with misspelled inscriptions or crudely executed devices that are otherwise very like the official issues. In some cases it is not at all easy to be sure whether or not a particular coin is "official" or "unofficial." Q. "What does "die orientation" mean, and what terms do you use to describe it on the data sheet?" A: "Die orientation" is the relationship between the obverse and reverse ("heads and tails") sides of a coin. Some coins, if held at their "12:00" and "6:00" points on the obverse and flipped-over, will have the reverse in the same orientation - the tops and bottoms of the devices will be at the same "ends" of the coin. This is called "Medallic Rotation." Many coins will not have this orientation, however. If the back is upside down when you flip the coin, it's called "Coin Rotation." "Die orientation," "die alignment," and "die axis" are all terms numismatists use to describe these conditions and the host of other possible alignments. The orientation is usually indicated by either drawing an arrow that shows which way the "top" of the reverse design points when the coin is flipped, or with a numeric angle "degree" like 0°, 45°, 90°, 180°, etc, from the vertical, proceeding clockwise. Q: "Please explain about Sear and RIC numbers." A: Scholarly numismatists have recognized the need to list most or all of the known types of coins in reference catalogs to be used by other people interested in the coins. This provides both a way to understand where a particular coin fits into the "greater picture" and provides a handy shorthand way of describing a coin to someone else by referring to it by its number in a popular catalog. David Sear, among others, has written an extremely important series of handbooks for various fields of ancient coins. His Roman Coins and Their Values has been published in several editions over the years and is in the process of being updated for the new millennium. So if I have a GLORIA EXERCITUS reverse of one of the Constantinian-era emperors, I could call it "S - 3952," and someone else with the same book would be able to know it was issued by Constantine II and has only one standard between the soldiers, where if I said "S - 3961," the other numismatist would know it was issued by Constans and has two standards between the soldiers. The Roman Imperial Coinage series, or "RIC," has been compiled by dozens of renowned numismatists over the course of the past century. It consists of ten volumes, some broken down into sub-volumes, which strive to list every Roman coin known to numismatists, and which put together occupy two feet of bookshelf. Some of the volumes are out of date, the work of 80-100 years ago with newer finds not included, but the overall work is still the most important, comprehensive, and scholarly way to describe a Roman imperial coin. In recent years, David Van Meter's A Handbook of Roman Imperial Coins has become very popular because it is somewhat more comprehensive than earlier editions of Sear and is the least expensive, most comprehensive book available at the present time. Even the least expensive of these references may, however, be beyond the means of a beginner, or a school class, so we recommend the on-line look-up sites like www.dirtyoldcoins.com and www.wildwinds.com as accessible sources for catalog numbers. Our membership at the group's site: http://groups.yahoo.com/group/ACEhelp/ is always glad to help with attributions, although we suggest they start out with hints to help you and your students find the coins yourselves before giving out formal reference numbers - we don't want to take all the fun out of it for you! Q: "Please explain about denomination and the classification of AE1, AE2, etc." A: The names of the denominations of the coins of the early Roman Republic and Empire are well known to us, and very easy to tell by the size and metal of the coins as well as by identifying marks such as the sort of headgear the imperial portrait is sporting. However the coins we are working with, by and large, have come down to us without our knowing what they were called or where they stood in relation to the rest of the monetary system or each other, so we refer to them as "First Bronze," "Second Bronze," "Third Bronze," and "Fourth Bronze," or AE 1, AE 2, AE 3, and AE 4. AE 1's are larger than a US half dollar coin: 28mm and larger. AE 2's run from about the size of a quarter to a half-dollar: about 22 - 27 mm. about 17 - 21 mm. Q: "Is there no ancient reference to the denomination of these coins?" A: Unfortunately, the times from which these coins come were very unsettled, and very little information has come down to us about what they were called. 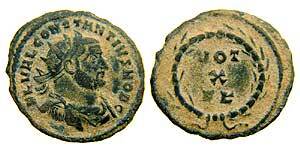 We have the name "follis," which may either mean a coin of about 300 AD, or a whole leather bag full of them. There are few Roman terms such as "centenionalis" and "majorina, but the numismatic community is divided as to which coins, specifically, these names describe. We are fairly sure that after 400 AD, the term "nummi" refers to the very tiny AE 4's that formed the bulk of that era's small change. Beyond this, we know nothing about what the coins were called by the people who made and used them. Q: "What is an "exergue"?" A: The exergue is the space at the bottom of the reverse of the coin, below the "horizon" or "ground line" on which the characters of the reverse stand. In the event of a reverse without this sort of line, if the reverse type is a wreath, for example, it is the area at the bottom, near the edge. On the coins you are studying, this area most often holds information about which imperial mint produced the coin, and which workshop within the mint, as well. This is an extremely important part of the coin to observe and record carefully, since the standard reference works for this era are typically arranged by mint first, emperor second.